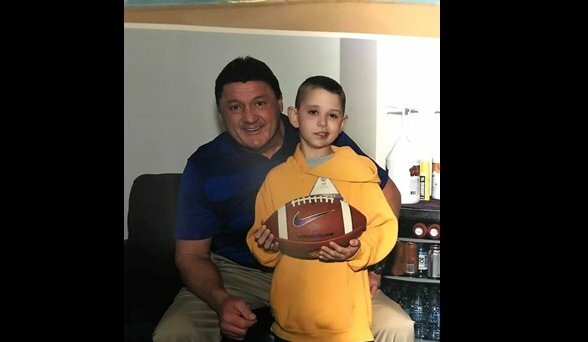 Drake, 8, with LSU Coach Orgeron at a game in November.. Courtesy of the family. Let's help make this young one's holiday wish come true, Our Community Now members! An 8-year-old Louisiana boy is hoping to receive Christmas cards from all over this holiday season. Drake Thibodeaux, 8, of Vinton, Louisiana, is hoping to receive 190 cards this Christmas to help bring him some cheer. Drake was diagnosed with diffuse intrinsic pontine glioma, or DIPG, early this year, and has been bravely fighting since then. Unfortunately, there is no known cure for the disease. His mom told local media that he enjoys all the things boys of his age love to do, like fishing and four-wheeling. However, his tumor is growing and making it harder for him to participate in his favorite activities. A family friend suggested on Facebook to flood Drake with holiday cards to help him get in the holiday spirit. He made a similar ask for his birthday, and quite a few people stepped up and sent him well wishes. It also means a lot to the family as they support their child through this difficult time. "We’re blown away with the support. People will come up to me and they’re like ‘thank you for letting us take part in this.’ I’m like, ‘I should be thanking you.’ I don’t know why they’re thanking me because it should be the other way around, but we’re blown away,” Danielle said to the news station. No matter how far we live away from this brave boy, we can all be a part of his support community. 'Tis the season for peace and goodwill, and what a perfect way to offer hope and a few smiles during the holidays.